A couple of years ago, my great aunt gave my mother a triple slower cooker as an early Christmas present. It has turned out to be one of the biggest time savers for our holiday meals. 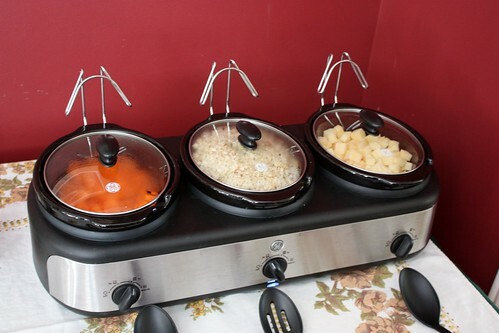 You can use this set of slow cookers to cook three side dishes at once or use it to keep them warm when they come out of the oven. For Thanksgiving this year, we used it to cook honey glazed carrots, our family’s favourite stuffing and mashed turnips. It saved us from having two extra pots on the stove and taking up the space in the oven for the casserole dish with the stuffing (we make ours vegetarian, so it doesn’t go in the bird). When the dishes are cooked, you can set the slow cookers to low and keep everything warm for serving up to your guests. These carrots are so delicious and incredibly easy to make. They do all the work themselves in the slow cooker. I like to cut the pieces on a diagonal for a nicer presentation. Add everything to the slow cooker and cook on high for 4 hours. Toss before serving. We make our stuffing in batches depending on how many people are coming. For a dinner with 18 people, we typically do 3 batches, which fits in our slow cooker. 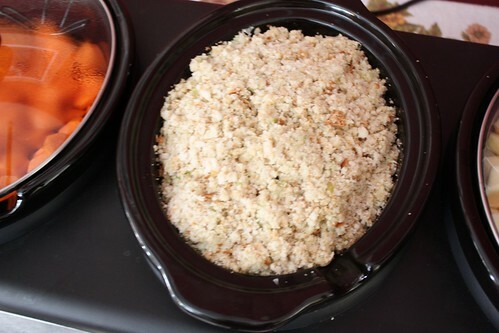 4 cups soft breadcrumbs – rip up by hand, use a cheese grater or use the grate setting on a food processor. In a medium frying pan, melt butter over medium-low. Saute onion and celery until translucent. Allow mixture to cool and then toss with the bread and seasoning in a large bowl until well combined. Mix in one tbsp of vegetable broth or water at a time until the stuffing is moist. 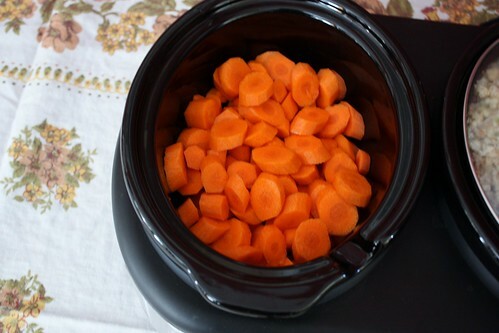 Cook in the slow cooker on high for 1 hour, then reduce heat to low and continue to cook 2-3 hours, stirring every hour. I’m not really a big fan of turnip, but it’s one of those things that we’ve always had at our holiday meals and I’m sure it will always be there. 1 large turnip (about 2 lb), peeled and chopped into 1/2″ cubes. 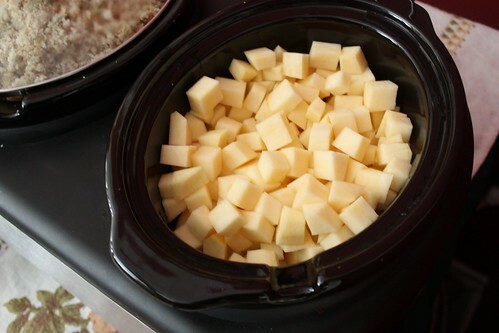 Put the chopped turnip and apple cider into the slow cooker on high for 2 hours or low for 4-5 hours. When it is fork tender, add the butter and mash with a potato masher. Season with salt and pepper to taste. 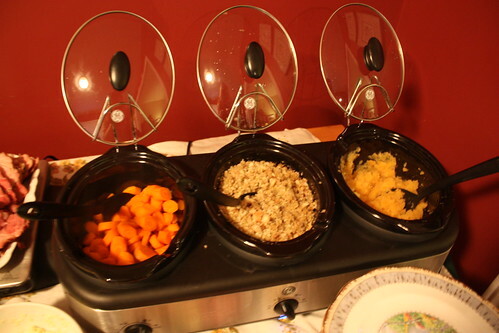 By the time the turkey was ready to come out of the oven, the side dishes were all ready. This model is great because it comes with a rack for the lids, as well as serving spoons. Any shortcuts that help us all spend less time in the kitchen and more time with our loved ones sounds pretty good to me. « Thanksgiving Dessert Mantel – A Pumpkin Extravaganza! this way.Saves so much time and tastes so good and fresh.Healthy too!